Have you ever heard a story that totally captivates and fascinates you? 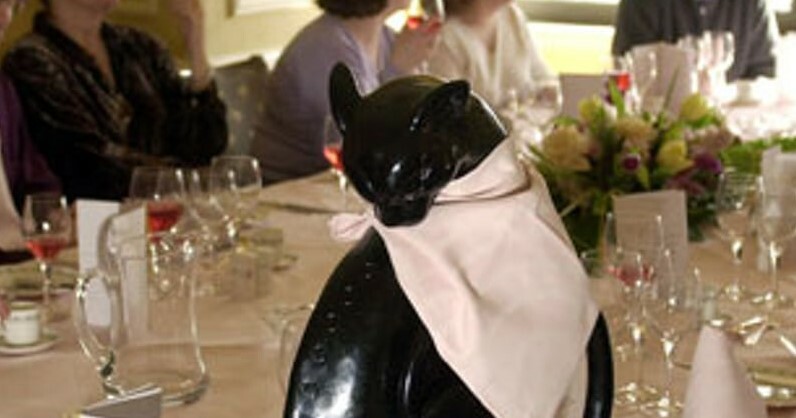 For me, Kaspar the black cat, the Savoy Hotel’s 14th Guest is one such tale, its origins is now a legendary story. 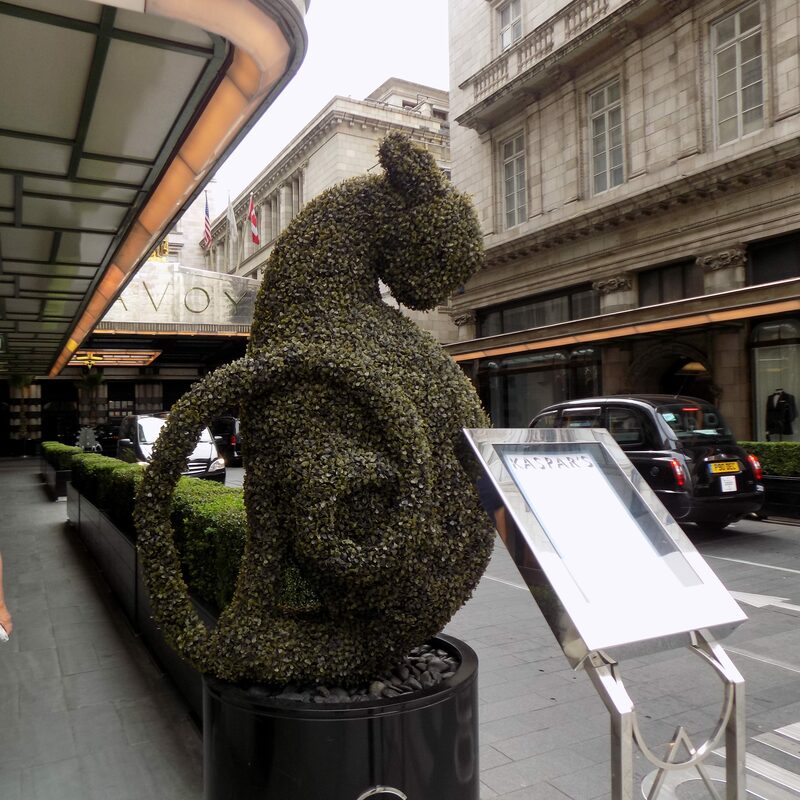 Sitting at the entrance to the Savoy right by it’s namesake restaurant menu, a plant carved in the shape of Kaspar the Cat. My husband and I recently had the pleasure of staying at the much loved, world famous, iconic Savoy Hotel where we celebrated our wedding anniversary in May. We had a fantastic time and the hotel really looked after us making us feel part of the “Savoy Family” you can read more here. During our stay, I was lucky enough to have a guided tour of the hotel by Guest Relations’ Shannon Lowe. I had a really fun and informative hour the highlight of which was the mysterious story of Kaspar the Cat, I was intrigued to hear more so we descended upon the hotels’ restaurant named after Kaspar, Kaspar’s Seafood Bar and Grill, where Shannon told the story and where I had the opportunity to meet Kaspar! So captivated was I by Kaspar and how he came to be, I decided you might also like to hear all about him and next time you’re at the Savoy Hotel, take a peak inside Kaspar’s restaurant to see the gold figurine for yourself, the main wooden carved Kaspar is kept as the “14th Guest” should the need arise. I know you’re just as intrigued as I was, so begins the story of Kaspar…. Woolf Joel was a prominent businessman with varied interests notably diamond mining. He was born in 1863 in Spitalfields London but resided in Johannesburg. 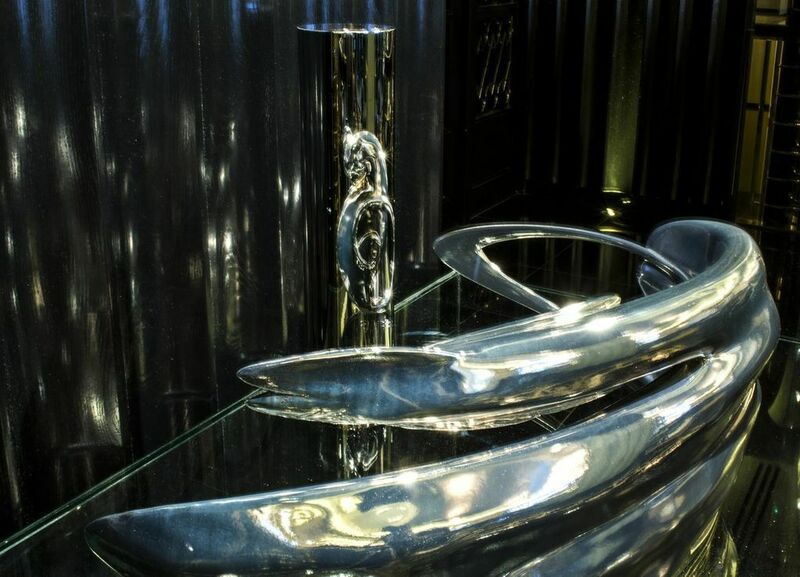 He became a frequent visitor to London’s Savoy Hotel where he was mesmerised by the hotel’s grandeur and impeccable service and let’s be honest, everyone who visits this opulent hotel is equally enchanted and captivated by it’s magic. Woolf frequented London on business many a time making the Savoy Hotel his home on such visits. During these visits, he would often entertain his friends and business acquaintances and one such evening in 1898, Woolf decided to say goodbye to them by inviting them to a farewell dinner at the hotel. He discussed his dinner plans with his friend, renowned hotelier Cesar Ritz (founder of the Ritz hotels) who suggested dinner at the Pinafore Room and he took it upon himself to arrange a special menu for Woolf and his 13 guests by the legendary French chef Georges Auguste Escoffier, the term “Escoffier” is still used today to describe sumptuous tasting menus in restaurants all over the world. On the day of this much anticipated farewell dinner, one of Woolfs’ dinner guests cancelled at the last minute so 13 guests sat down to dine. After a joyous evening where guests laughed and drank and a jolly good time was had by all, Woolf said his goodbyes rather early as he had to plan his journey to Southampton the following morning. As he rose from the table he laughed incredulously at one of his guests who described the old superstition if 13 dined together, the first to leave the table would be destined to die first! Woolf had never heard of such a ridiculous thing and chuckled to himself as he made his way to his room. The original Kaspar from the early 1920’s carved out of wood sitting at the table with a napkin ready to enjoy a meal as the “14th guest”. A few weeks later, the most shocking news had reached London and the Savoy Hotel that Woolf Joel had been the victim of a shooting in Johannesburg, he was dead!! Everybody was understandably distressed, Woolfs’ death caused considerable consternation, none more so than his good friend Cesar Ritz who along with the Savoy Hotel made it his mission to devise a plan on what the hotel could do to assist superstitious guests and diners in the future. This was not good publicity for the magnificent Savoy, it was gaining quite a reputation and fast becoming the “place to be seen” among nobility, celebrates and dignitaries so after much discussion and deliberation, an ingenious solution was devised so that if there happened to be thirteen guests at a dinner party, a member of the hotel staff would be recruited to sit at the table with the other guests, but obviously, this would prove to be problematic as guests required privacy and relaxation during dinner, not a waiter sitting embarrassingly at the table looking quite foolish and uncomfortable, I can’t think of anything worse! Kaspar today, sitting proudly on a beautiful glossy table at the hotel with a brief description of his fascinating story! It would take several years, the mid 1920’s to be exact before a more appropriate solution was thought of. 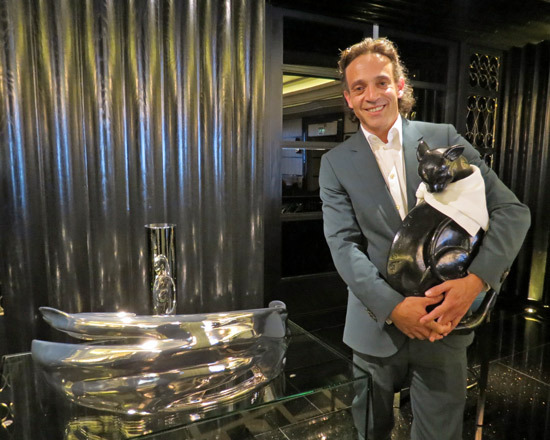 The Savoy would commission the designer Basil Ionides to create a three foot high cat which was carved out of a single piece of plane tree, he was christened Kaspar and the cat would sit on the fourteenth chair should there be thirteen guests dining. Kaspar would have a napkin tied around his neck and he would be served a whole meal along with the other diners with his own china and cutlery, it was a sight to behold I’m sure. 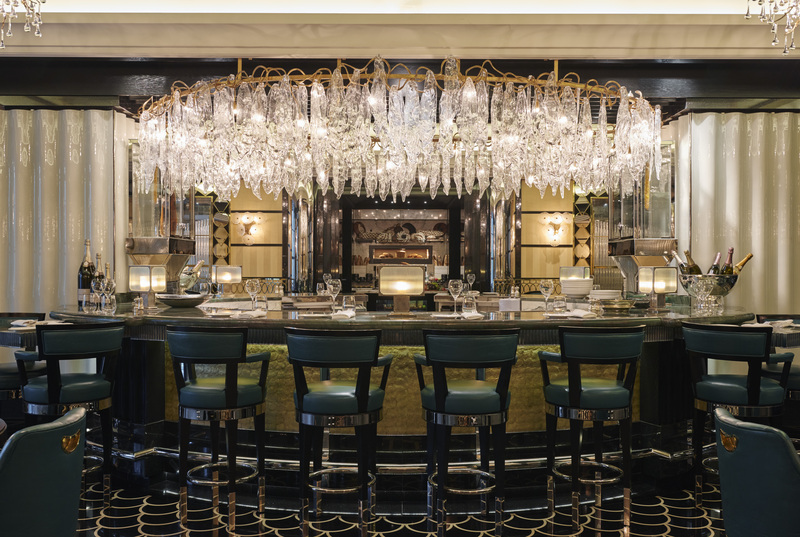 Thus ensured that all of the SavoyHotels patrons of that golden jazz age would leave the table very much alive and well safe in the knowledge that no such hideous fate would behold them. Kaspar today, sitting with fellow diners as guest number 14. 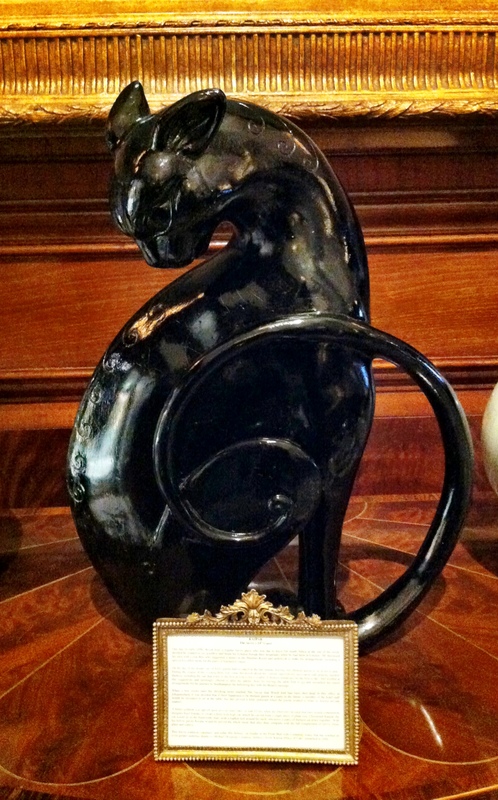 Beautiful glossy black Kaspar, the Savoy Hotels’ 14th Guest. This tradition continues to this day where Kaspar sit’s at the table as the 14th Guest but he is not served with a meal, merely sitting there much to the delight of his fellow diners, in fact, many people now dine in groups of thirteen so they can enjoy the experience of Kaspar dining with them, it makes for a fabulous photo!! 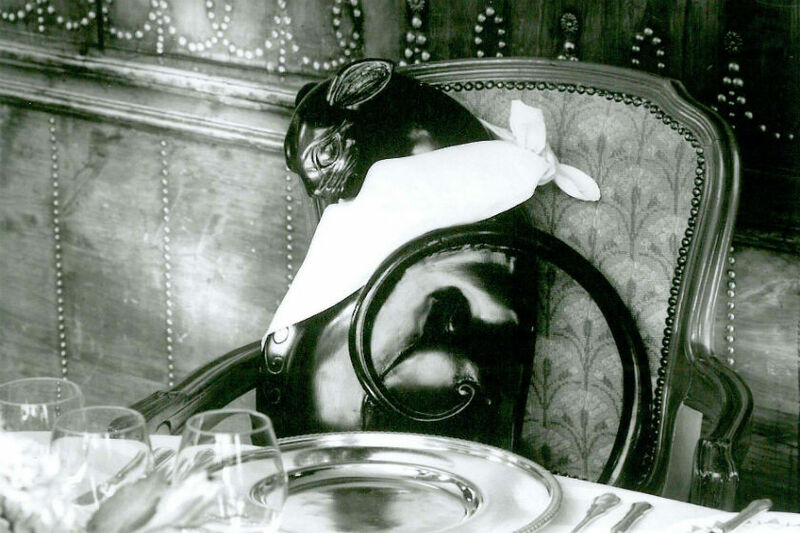 Today’s diners are guaranteed that once they return to their abodes, all that is left is a curiosity satisfied by dining with Kaspar, the famous 14th Guest. 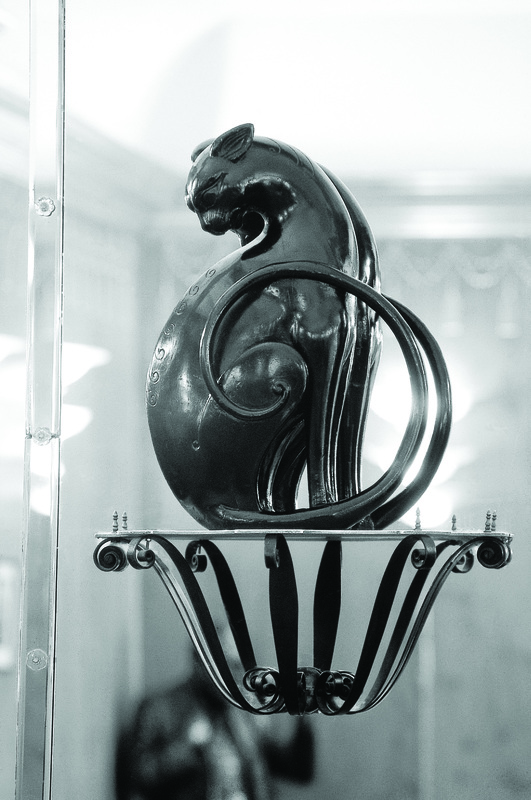 He now lives in the Savoy Museum gathering celebrity status and a greater audience thanks to the popular children’s books “Kaspar, Prince of Cat’s”. It’s an enchanting tale full of mystery and intrigue that endears to this day and I really enjoyed hearing all about it. Someday I would like to experience and see for myself what it’s like dining with Kaspar and imagine the laughter and fun that was had at the dining table on that fateful 1898 evening all those years ago. The story of Kaspar the Cat is told in my own words.